Police have arrested a man who had been running a hospital for about 10 years using a forged licence to practice as a surgeon. 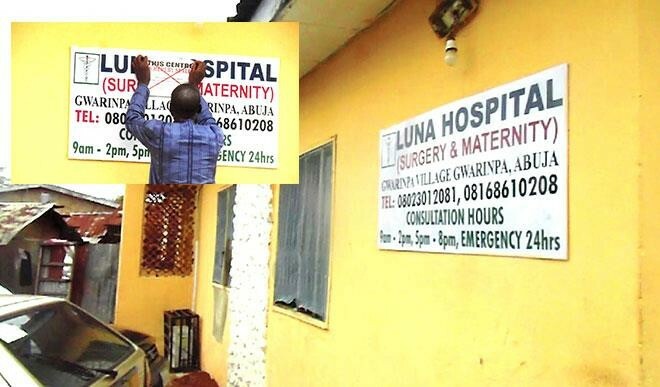 Until his arrest last Friday, Victor Moffat Akpan had ran his Luna Maternity & Surgery Hospital in Gwarinpa village, a neighbourhood of Gwarinpa Estate in Abuja, since 2006, outsmarting territory regulators who checked the hospital annually. The hospital was in a converted apartment where he checked patients, had five hospital staff, delivered pregnant women of their babies, performed caesarean sections and surgically removed fibroids. He registered the practice with the Private Health Establishment and Monitoring Committee (PHEMC), under the FCT Health and Human Services Secretariat (HHSS) as a surgeon using credentials now discovered to have been forged. The Medical and Dental Council of Nigeria (MDCN), which regulates the practice of doctors and dentists in the country, recently got evidence that Akpan was not on its register but was instead using a folio number assigned to another doctor. Aso Chronicle gathered that the council immediately sealed the hospital premises while police arrested the suspect and are investigating his claims. At the time of questioning by the police, Akpan insisted he was a “homeopathic doctor” but admitted that his certificate was forged with the help of an administrative officer, one Mike Nwagbara, who worked at the University of Nigeria Teaching Hospital 10 years ago. Homeopathy is a branch of alternative medicine, for which MDCN also issues practice licence. Akpan, from Akwa Ibom State, still claimed during questioning by police to be a “homeopathic doctor” who graduated from an Enugu-based College of Homeopathy. He had approached the MDCN for a practice licence in 2002 but was denied because his school was not recognised, according to MDCN investigators. Piecing a timeline before the police, he said he paid Nwagbara N15,000 to forge an MDCN licence to practise as a surgeon. He never knew the actual doctor whose registration number appeared on the certificate. The folio number belongs to a Dr Tuoyo Awani, a 1995 graduate of University of Benin. Some documents also believed to have been forged showed Akpan to have interned at Calvary International Hospital in Enugu in 1996, while he did his National Youth Service with the Prisons in 1997, attended an update course by the West African College of Surgeons (WACS) in 2001 and a postgraduate course on the “scientific basis of obstetrics and gynaecology in 2002. Aso Chronicle also gathered that Akpan had only A3 in Geography while he obtained P7 and E8 in the rest of the subjects he sat for in the 1990 Senior School Certificate from Eastern Nsit Secondary School, Odot among his credentials. With his surgical licence boasting signatures from the prestigious WACS, Akpan was a member of Private Health Establishment and Monitoring Committee (PHEMC). Operating under the umbrella of PHEMC, he also used his “licence” to cover two other private centres where he was booked for surgeries, which he performed and was paid for, until the secretariat decided his single hospital licence could not cover three separate facilities, according to Dr Ibrahim Tata, registrar of PHEMC. Limited to just Luna, Akpan expanded his services to reach more patients, Aso Chronicle saw on a visit to the hospital. Tests result forms were modeled on regular hospitals’. In a documentation room, which opens into the street at the back of the house in Gwarinpa village, patients’ folders dating back to 2007 were stacked on waist-high shelves. Some five patients, including two mothers with babies, sat in the waiting room. Clinic runs in two daily batches—9am to 2pm, then 5pm to 8pm. Emergency ran 24 hours. One certificate framed on the wall shows the National Health Insurance Scheme accredited Luna as a health care provider. Five staff were on Luna’s duty roster at its closure. One room is an admission ward, a second is a theatre and a third is a labour room where he took deliveries. His personal office doubles as a consultation room. Pictures of him, his wife and his pastor were pasted behind him. A patient examination bed lined one side of the wall. Above the bed was a collage of photographs showing Akpan’s success stories - babies he delivered, women who underwent C-sections under his scalp knife and fibroids he removed. A stethoscope and pressure cuff were displayed on his desk, next to a POS machine. He insisted he was a homeopathic doctor when investigators and police first spoke with him in his office. Asked what use a stethoscope and pressure cuff had in a homeopathic practice, he simply said he needed them to take patients’ heart rates and blood pressures. Patients’ folders seen by Aso Chronicle, some of which have been taken into evidence for police to prosecute Akpan, showed he meticulously used medical shorthand to prescribe drugs for his patients. He prescribed on sheets of paper torn from school exercise books and filed inside patient folders. PHEMC, which registered and visited the practice at regular intervals, didn’t suspect foul play until the MDCN began investigating Akpan over a medical report he issued on behalf of a female patient dating back to 2013. Akpan authored the report as the doctor who treated injuries for a woman assaulted on separate occasions by her husband and lawyer, as he claimed in an affidavit. The report came under scrutiny for typographical errors and inconsistencies unexpected in a medical report. It was to be used in a case before the disciplinary panel of the Nigerian Bar Association. Dr Henry Okwuokenye, head of inspectorate unit at MDCN, said Akpan came under closer scrutiny when the council began investigating him for misconduct. 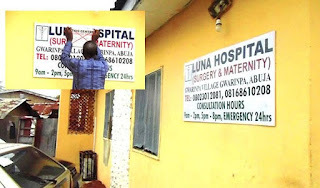 He obtained documents Akpan presented to PHECM to register his hospital and made the link between the “Luna” surgeon and the fresh graduate seeking licence to practise homeopathy in 2002. MDCN handed over the documents to police on Friday as Akpan gave his deposition ahead of prosecution.